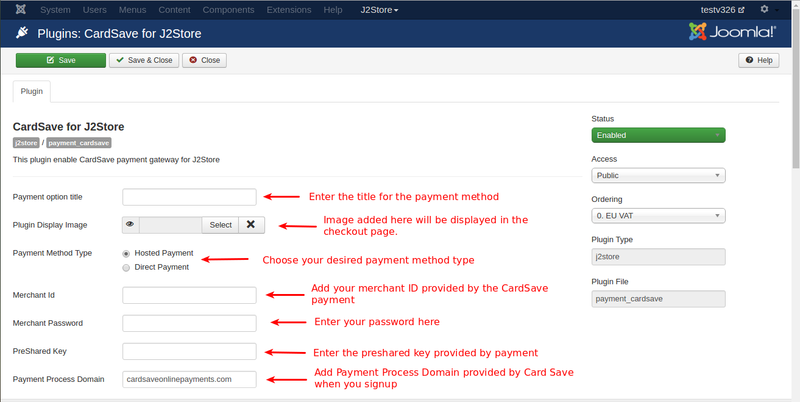 This pulgin integrates CardSava payment plugin with J2store. Hosted Payment: Payment transaction will be processed in payment's domain. Direct Payment: Payment transaction will be processed in J2store itself. This is your merchant ID provided by CardSave payment. You will get this when you signup. Payment will send you an email with merchant ID and password. Please enter the password provided by the Cardsave payment. Please enter the Pre-Shared key associated with your CardSave payment. Add Payment Process Domain provided by the CardSave when you signup. You will get your Payment Process Port with payment process domain through Email when you signup. Choose the Hash Method associated with your CardSave account. The text entered here will be displayed to the customer before he makes the payment.Using this [ORDERID] tag, you can add order ID in your description. Using this [INVOICE_NO] tag, you can add invoice number in your description.